Tigers are breathtaking, captivating, elusive, powerful, and mysterious. They have taken over my world and I could not be happier! Twelve days ago I saw Tiger Trail for the first time when my son and I attended a special donor preview event on May 22. I wasn't sure what to expect, but I did know that we would see tigers like never before. The anticipation mounted as we walked along the pathway lined with wooden posts. We had been down this path so many times over the past two years, but this time it was different. No longer did the path end with a barricade. Now the path opened up to a beautiful plaza giving way to the entrance of the Tull Family Tiger Trail. After finding Dylan's name on the donor plaque, we began walking down the bamboo lined path toward the Indonesian tiger statue. I could feel myself leaving one world and entering another. I was in Indonesia; surrounded by lush, green foliage and the soothing sound of a waterfall in the distance. Along the path were beautifully hand-carved wooden benches. Each one unique and a piece of art. 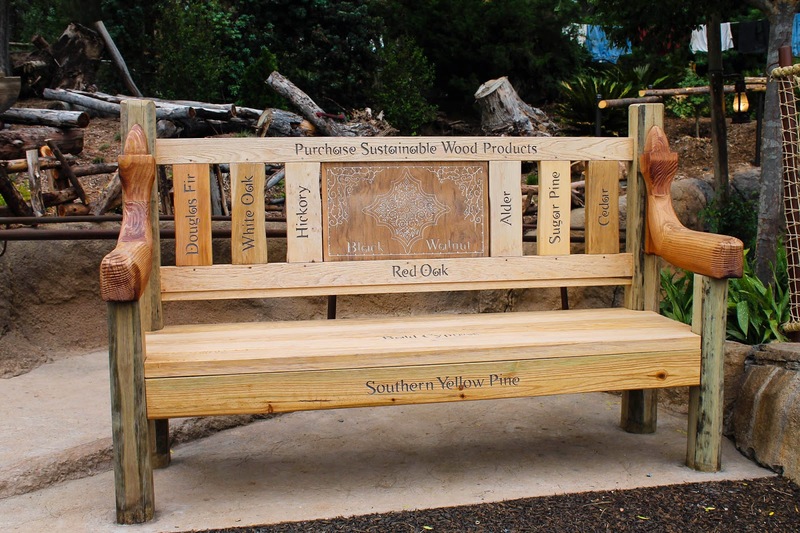 These benches call to you, inviting you to sit and take in everything around you. Then, as I turned the corner, I saw him. Standing there only a few feet away from me and looking into my eyes was Teddy. I was mesmerized by his beauty. Teddy is a 10-year-old male Sumatran tiger and he loves to pose for the camera. As you can see, Teddy is quite handsome. Across the way I saw another tiger. One I have not seen since he was a small cub, only a few months old. It was Conrad and he stole my heart with his captivating eyes. Everywhere I looked took my breath away. The San Diego Zoo Safari Park did an amazing job designing this new Sumatran tiger habitat - not a single detail was left out. From the moment you walk through the arched branches you feel an overwhelming sense of calm and serenity. The message of tiger conservation is apparent throughout the exhibit. 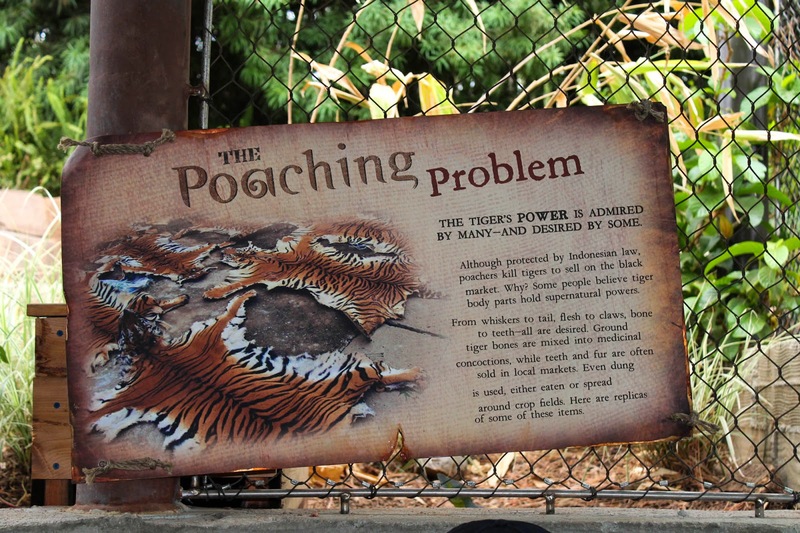 Whether it be a sign explaining how tigers care for their young or the Pondok where you can learn about poaching and illegal trade of animal products, it is clear that San Diego Zoo Global is serious about creating awareness and bringing these endangered species back from the brink of extinction. 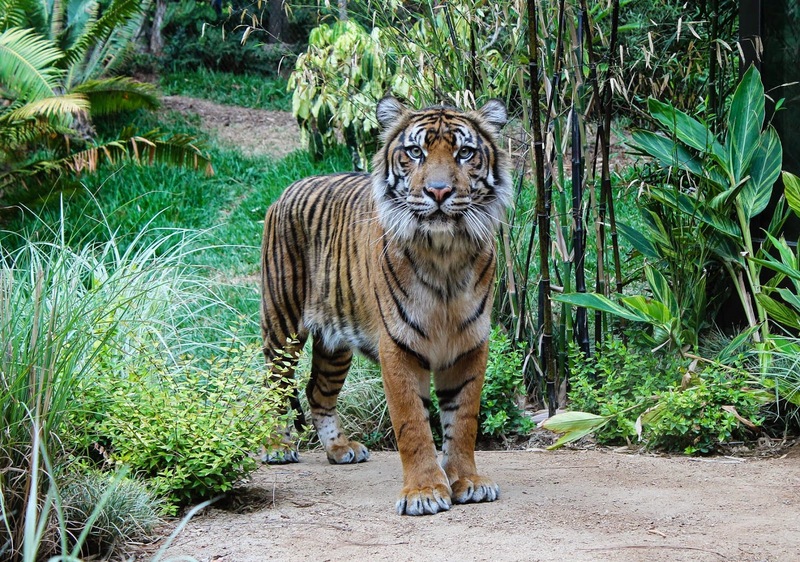 This new 5.2 acre Sumatran tiger habitat is home to six tigers. Delta just celebrated her 16th birthday and is the grand dame of Tiger Trail. She is the mother of the four young tigers (3-year-old sisters, Joanne and Majel and 2-year-old brothers, Conrad and Thomas) who were all fathered by the dearly departed Utan. Teddy is the new comer and we have high hopes that he will breed with one of the females to start a legacy of his own. Dylan and I have been following the construction of Tiger Trail since they broke ground and I am honored to have my son's name listed as one of the many donors who helped make this new tiger habitat possible. Seeing something so beautiful left me speechless. 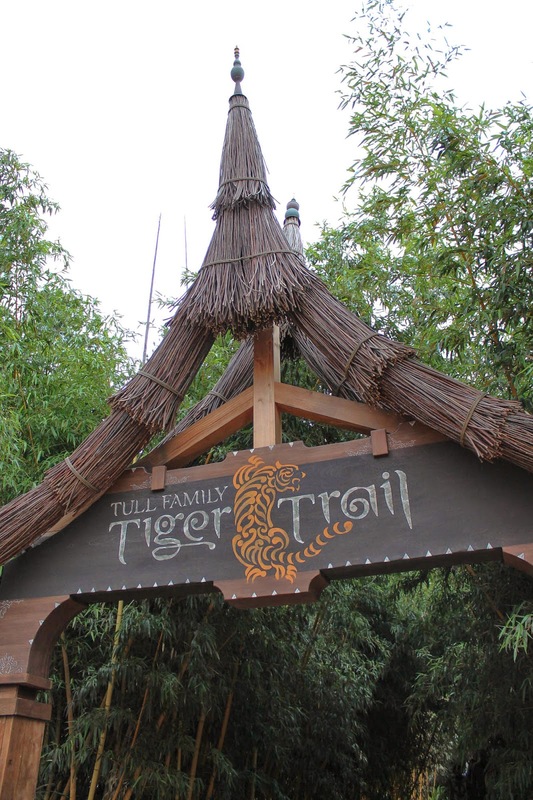 I was (and still am) in complete awe of the new Tull Family Tiger Trail. I have been back three times already and still have a difficult time putting it into words. Aside from wanting to visit every chance I get, I have been inspired to do more for these magnificent animals. 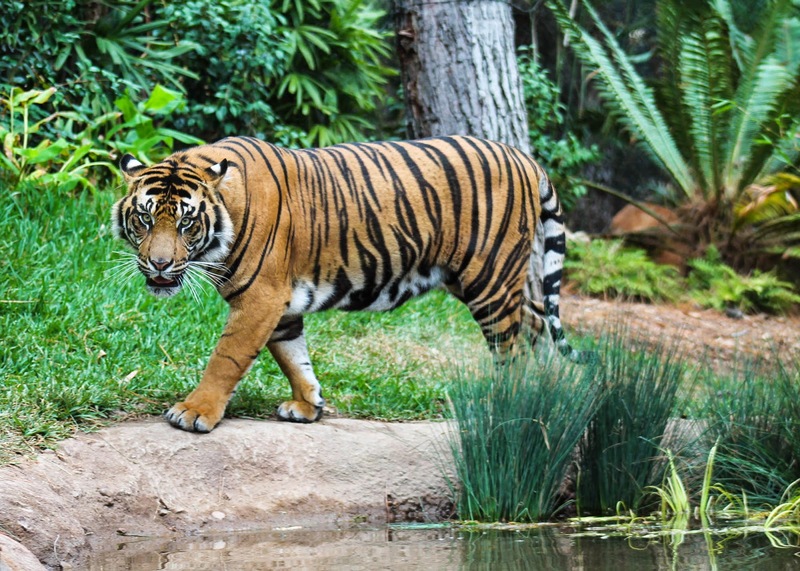 Fewer than 350 Sumatran tigers remain in the wild and this number continues to drop. There are currently 270 Sumatran tigers in captivity as part of the Species Survival Plan (SSP). Scientist estimate that these tigers could be extinct in their native Sumatra by 2020 unless we take action now to protect and preserve the Sumatran tiger. That is only six years from now. Humans have driven the Sumatran tiger to the brink of extinction and now humans must be the ones to save them. The Tull Family Tiger Trail is a huge step in the right direction to help save the Sumatran tiger. Seeing a tiger walk up to you at eye level and hearing a tiger vocalize to another tiger is something I believe everyone should experience. If you have not been to see the new Tiger Trail, I urge you to visit the San Diego Zoo Safari Park soon. You will not leave as the same person you were when you arrived. Tiger Trail has a way of changing your mindset. You will become one with the tiger. You will live life, like a tiger. Tiger Trail is breathtaking, captivating, elusive, powerful, and mysterious. See more photos of the tigers and of Tiger Trail on my Flickr page. 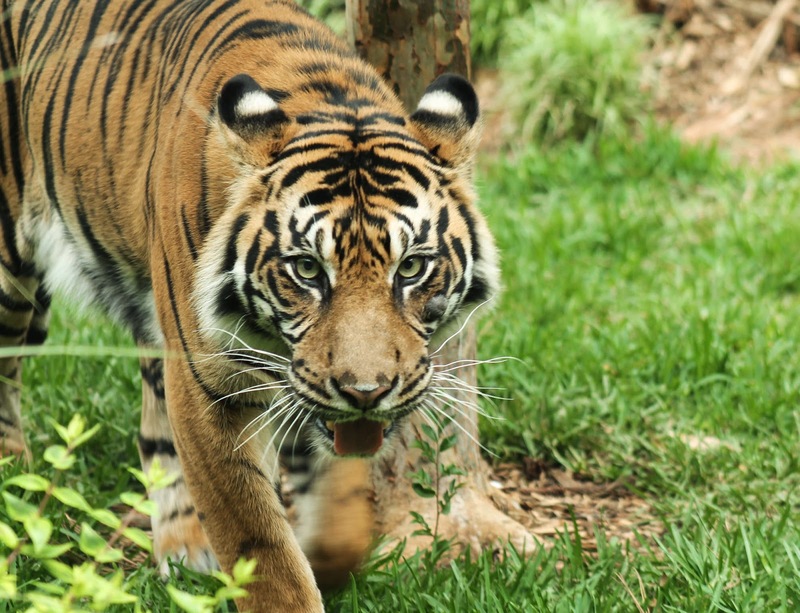 To learn more about the Sumatran tiger you can visit the Tiger Trail website.